During February, our first guest blogger of 2016, Helen Reid, has been writing for us – a huge thank you to her! Jane Chelliah is a 52-year-old Asian blogger who blogs on politics and feminist parenting. She became a feminist when her daughter was born because she did not want her little girl to grow up accepting cultural practices and the patriarchy as the norm. Jane works in the public sector, is chair of a charity for women with learning disabilities called Powerhouse, represents UN UK Women on the Gender Action for Peace & Security and practices intensive mothering even though her daughter is 16 years old. This month, The F-Word will be featuring posts from different bloggers on feminist parenting, which some of Jane’s posts will be touching on. The photo is by Greta Ceresini and is used under a creative commons licence. It shows a person paragliding; they are silhouetted against the bright blue sky, with wispy clouds around. 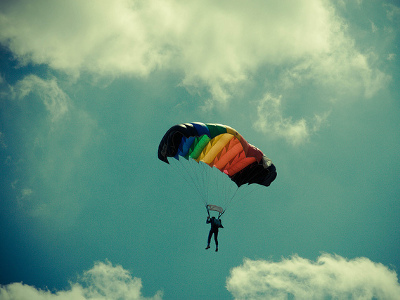 The paraglider is bright, rainbow colours.